At Leland, we believe enduring design starts with understanding the world around us and that’s exactly how the process for Handy Stool began. For some time, Leland had been contemplating a small-scale seating product. Our informed assumption was that the workplace needed a simple solution—one that was dynamic, fun, and didn’t command a big footprint. As it turned out, industrial designer Steven Philips, who is based in the London office of Arup Group, was looking to develop a similar product for his office. Philips’ approach began with asking and observing. Taking all insights into consideration, Philips arrived at the design you see today. Handy Stool looks friendly and approachable, but it’s also packed with science and engineering. Arup engineers carried out a dynamic structural analysis to determine how the shape would perform when people sit on and move within the seat. Leland’s portfolio all started with the Marquette chair, which gave designers countless options for finishes, combinations, and aesthetics. Handy carries on this rich tradition, offering 4 polypropylene shell colors, endless textile options for the upholstered pad, 3 wood species options for the wood seat pad—white oak, walnut and maple, available in Leland’s 33 signature wood finishes. Handy is an essential design, brilliantly executed—a stool so refreshingly and stunningly useful, it could only be called Handy. 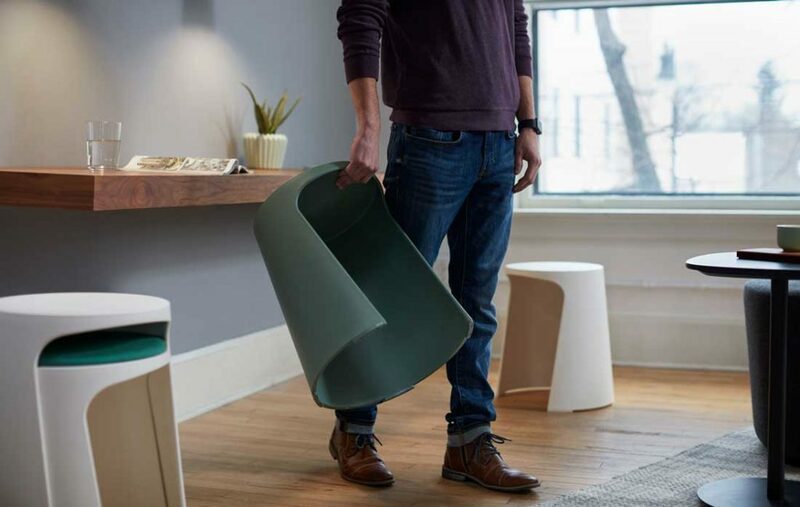 Featuring a sturdy shape and signature opening for easy storage and movement, Handy fits right into buzzing offices, college classrooms, and more. You can stack up multiple Handy Stools to save space, and they’ll still retain their pleasing aesthetic. Packed with color and material customization options, Handy encourages fresh and impromptu connection and brings a lively spirit to any collaborative space.